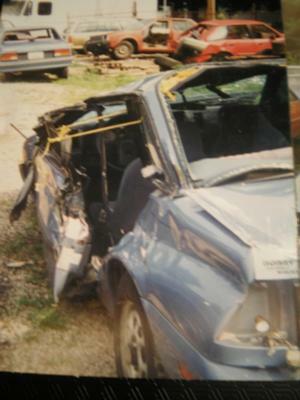 On July 15, 1996, we had a terrible auto accident. It was so foggy and rainy. While driving on our way to work, I lost control of our car. We slid in a ditch. I jerked the wheel pulling us out. Little did I realize the right axle was broken. I tried to go forward, but we were thrown into a spin. All I knew to do was throw up my hands and say "GOD IT'S YOURS." The car flipped several times and almost went over a guard rail. Our oldest son was thrown out of the car and into the woods hitting a tree. He got up with only a scratch to come back and find me.- He went to someone's house, called 911 and some friends. My husband was thrown out and pulled partly under the car damaging his left arm. Our youngest son was still trapped in his seat belt and upside down. He only got a scratch on the top of his head from a small piece of glass while climbing out the back window. I was messed up severely. The rubber strip had come off the metal on the drivers side door. The metal scalped my head. I was cut all over. My right ear was cut off and the left ear was just missed, my skin was pealed to the front of my face, skull cracked, spleen torn and bruised as well was the rest of my body. It took over an hour for the paramedics to get to us. In the meantime, I was getting upset wondering 1. where my children were 2. if someone could move the car 3.needed someone to call our boss to tell him what happened. A lady stopped by to see what she could do to help. I first asked her to pray for me. I really thought I was going to die. She told me she could not pray. That broke my heart. I started telling her about Jesus. Then she asked me if she could call someone for me. I gave her my pastors name and number. After a while, the paramedics showed up. 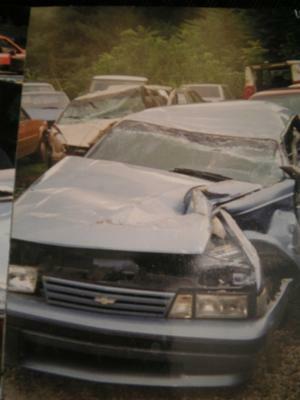 I had to be cut out of the car by the jaws of live; however, because of my injuries, they still could not pull me out. I told them that I could get out if they would get out of my way. As I crawled out and turned over on my back, I felt the life leave my body. I heard one of the paramedics take the Lords name in vain. That made me so mad. I told him that he needed to repent. He told me he was sorry. I explained to him that he did not need to apologize to me , but to God. ( HE HAS SINCE GOTTEN SAVED-- PRAISE THE LORD!!) They put me in the ambulance and proceeded to put a body suit on me because I had no pulse or blood pressure. I was transported to the local airport to be airlifted to a larger hospital. When I got there, they did all kinds of test on me. They were ready to do surgery, but I would not let them til I new if my children and husband were ok and that I was prayed for. I was waiting on my pastor to get there. My pastor and grandfather came to the hospital. My minister prayed for me and my grandfather and I patched things up. The doctors told them that they were only going to sew me up to go in a casket. I was put on life support. After four days, I was able to be taken off and breathing on my own. 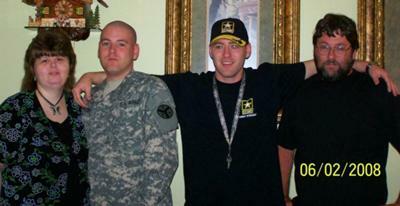 I was home one week after the accident. The doctors and nurses were amazed. I told them that I SERVE A LIVING GOD. and that NOTHING WAS IMPOSSIBLE WITH HIM!!! God has brought me so far so fast. I TRULY BELIEVE IN THE POWER OF PRAYER AND GODS HEALING POWER!! !